With the strikingly cold "Northern Southeast Asian" winter hitting the chilly depths of 12-15 degrees C in the early mornings it's been a time for adding a vest and a gilet to many rides in the past few weeks. Now, of course this isn't really cold, at least not if you're from a northern European climate, but when your average daily temperature rarely dips bellow 30 degrees this is positively freezing. This cold snap gave me the perfect opportunity to wear in the fancy-dandy Rapha Gilet, a sleek little number from the designer label and beard wearing top-end tailors of cycling kit. 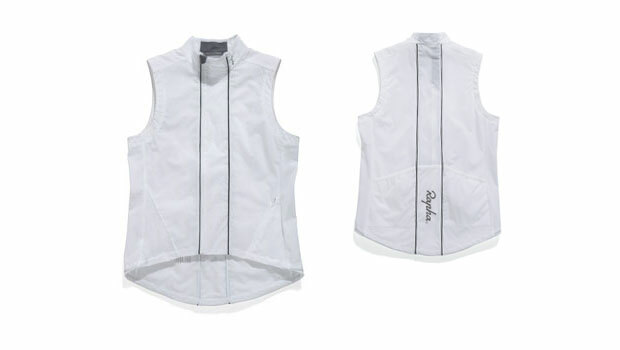 As with 90% of Rapha garments this is one handsome piece of kit, all white (also available in black) and wind-proof with a slight black piping and a reflective Rapha motive on the back and collar. Made from 100% nylon, with a back length mesh strip the gilet has a bullet-proof feel to it, although it is still stashable in your rear pocket. There are two pint sized rear pockets, and a small side zip pouch, giving it a usefulness beyond simply stopping the wind. The bottom line - a great looking, durable and practical piece of kit, not excessively technical in design, but does an admirable job at keeping the chill out. Is it worth the US$190 price tag? Well, I guess that one depends on if you're comfortable parting with so much money for a simple gilet - and it seems many people are.